In general, it appears that there has been much misinformation regarding this project. For example, in the March 2004 Preliminary CAC Recommendations on Conceptual Design, it states that “It enhances transit rider convenience by keeping all transit functions on one side of the street, which will require fewer street crossings.” However, since stops will be 5 blocks apart, longer walks will be required and street crossings will not go down. In addition, this document also claims that “It will provide the greatest future urban design and multi-modal flexibility on 5th and 6th Avenues to adjust to changes in demand and street use over time.” In reality, it will not be able to operate a high amount of either bus or MAX service and parking won’t be possible. If grade-separating MAX really isn’t feasible, it could have been put in the left lane on the mall. 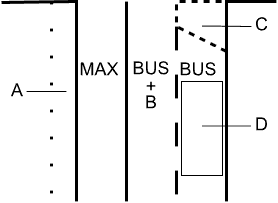 MAX would not affect buses and stop spacing for both would be flexible. If increased vehicle access really does help business, there would be plenty of room for it in the bus lanes during off-peak periods. C: Possible curb extension to prevent conflicts between buses and right-turning autos, also makes buses in the center lane more visible to pedestrians, reducing crash risk. D: Bus stop; some could be for peak-only lines and used for parking or deliveries off-peak. Without MAX there, the left lane should be limited to bicycles and other human-powered vehicles during peak periods. Many users, especially newer ones, skaters and skateboarders, are not willing to mix with traffic. And while the Park Blocks are nice, none of the intersections are signalized. Overall, it would really show that Portland supports other forms of transportation. "On the face of it, building light-rail along Interstate 205 to Clackamas County and installing it along Fifth and Sixth avenues, from Portland State University to Union Station, were two distinct projects. Had the federal government chosen to treat them that way, nothing would have happened downtown."